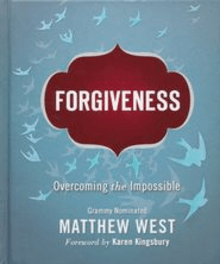 That’s the chorus to Matthew West’s aptly named song “Forgiveness”, and those four lines of music are perhaps the best way to summarize his new writing project, Forgiveness: Overcoming the Impossible. For years, West had made it his mission to collect stories of God’s power from Christians all across the world. After receiving over twenty thousand stories from people throughout the United States and several countries, West began to see a common theme emerging from each of these letters: forgiveness. Part devotional, part testimonial, Forgiveness spotlights a few of these personal stories to remind Christians of the freedom we have in Christ. It’s easy to see West has poured a great deal of personal thought into this book, but how does the completed project hold up? The book’s formula is pretty simple. Each chapter begins with a story, then West follows up with some of his own reflections and personal commentary. With eighteen stories in all, you might think the theme of forgiveness would run stale after a few chapters, but each testimony is unique and offers different perspectives for readers to take in. In one section, a woman recounts her journey to forgive the drunk driver that killed her daughter. In another, a man talks about the forgiveness he received after his affair almost destroyed a marriage. In the end, it’s very hard to be critical of Matthew West’s literary endeavor. With such a simple outline, the book accomplishes its goal without overcomplicating things. The only potential issue readers may have with the book is its pacing. Forgiveness was designed to be read in short increments, and speed-readers will find the chapters running together if they’re not careful. As for the message, it will resonate load and clear with anyone who picks up the book. The moment we choose to forgive is the moment we are set free.